The video below explains the process of hiring a writer. This is the first part of creating the killer blog post and that is to get something written. 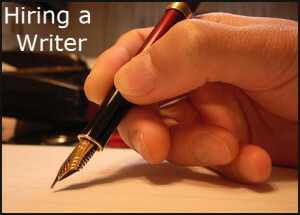 Here are some more recommendations, and tips to make using Hire Writers.com worthwhile. If you have to write the whole article you purchase over again, then it isn’t worth it. The most important part of this process is to put in the description what you would like to have written. I have tried it with just a few lines and got junk, the more I’ve put in there, the more guidance I’ve given the writer, the better the article has been. I know what you’re thinking, if I have to write a two hundred word outline, then I might as well have written the whole article. That isn’t the case. Your outline should have a beginning, middle and an end. After you put in a great description, figure out what level of author you want to complete your masterpiece, decide the length of time you want to give them, you submit the project. Here is something that many people don’t realize, your article goes into the mix and anyone with the level you put can begin the article. Once the article starts, your article comes off the market and no one else can start it. The longest I’ve had an article in the open market was about fifteen minutes. This is why it is extremely important when you find a couple of articles that you like, you can favorite them and then submit it only to them. I have found that most of the authors when they have finished will give you a rough idea of the times they normally ‘work’. When the article has been submitted, make sure that you read it. There will be some mistakes, but they should be only minor ones, any major ones send it back to the author and detail exactly what they messed up on, and how they should fix it for you.If it is garbage, let them know it. Communication is key, once you’ve got the killer article, the next thing we’ll do is work on the perfect blog post. Check out our DIY Web Design series.